Sorry it took so long, but I really tried many times to make clear things out. But what IS a SG Game? - and those who want to protect it at all costs. Users would create strip-replies to the strips involved with their characters and their stories, fighting or teaming up against one another. But SG Unlimited takes a new spin on the formula. The role of the main bad guy is so called "Void Emperor". people can either join him in this quest of destruction, or try to rally up and fight against him. Before the battlefield was only the "main" universe of StripGenerator, but this time we want to take it to many diffrent universes. Maybe YOUR universe? Also there's a side plot of collecting pieces of amulet to stop the Emperor and bring out the guardian of the multiverse - The Enforcer. And once more people can join in to help with the search, try to find the amulet for their own gains, or try to stop the party at all costs. We are aware you are all busy butterflies with personal lives and projects to look after. If your participation is too much to ask for, the SG game WILL continue as a single man project. This time we play for keeps. Sounds neat! How can I join? That is also true ma'am. There are few rules regarding users and creation of strips. for starters. PLEASE DO NOT STRIP SPAM! We all know you would love to join the story and push it further, but let some of us gather our creative forces to come up with a proper strip comeback. we are but mere mortals and we need sleep and nourishment. we also live in diffrent places of the world, so give us few hours before trying to keep going ok? Another thing. NO THEME PACKS. ESPECIALLY WHEN CREATING YOUR CHARACTERS FOR THE GAME! Just because YOU have them, doesn't mean you have to rub it in people's faces and making your characters unusable (I'm looking at YOU. Yes YOU.) Theme packs can only be used for background and unrelated to the main plots things and characters. We are sure your character doesn't need 20 tons of yellow to stand out. Not following the rule will result in stuffing our fingers inside our ears, screaming "LA LA LA LA IT DOESN'T COUNT", regarding your strip as non-cannon and ignoring it altogether. But certainly SOME rules has to be applied right? That's simple sport! Before you had to create a character sheet with all sorts of weaknesses, strong points, stats etc. but this time, all you need to do is to provide a character description and where it comes from. That's right, this time around you can be a crazy-powered god, or a random guy from the streets. But beware, because other users can do the same! Immovable object meets irresistable force indeed! 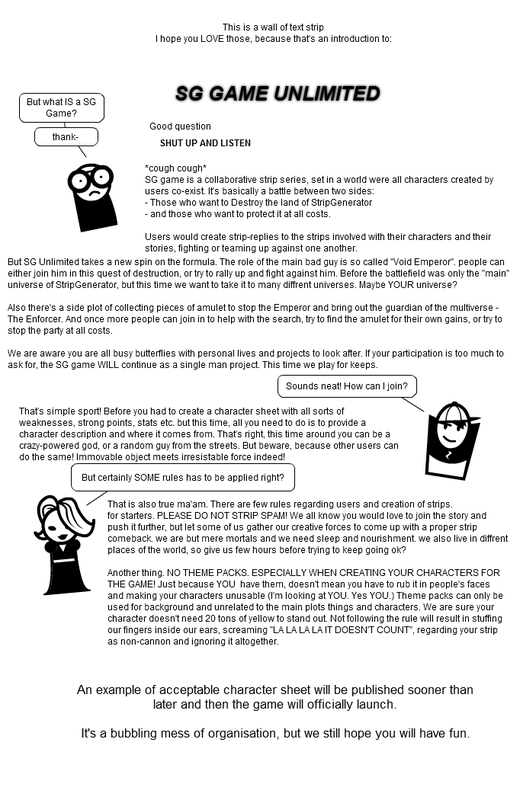 An example of acceptable character sheet will be published sooner than later and then the game will officially launch. It's a bubbling mess of organisation, but we still hope you will have fun. @Julian: I don't know, did you manage to actually make a strip to end the SG tournament? My mans, how long does it take to make a default char sheet? that's gotta be the easiest thing to do here. Oh yess, the game is on!